As your student’s principal, I am looking forward to assisting others in providing all students the guidance and support necessary to be successful in whatever path they choose to take after high school. I believe you will find that the faculty and staff at Galena High School have a strong commitment to education and student achievement. High school is more than just academics. Students who take an active part and get involved in high school activities tend to perform better in the classroom. There are so many opportunities available for all students so please encourage your student to get involved. Our gym floor has taken on a new look this year. The floor has been sanded and painted. We now have the biggest Petey in the county on our floor. If you happen to stop by, please check it out. You won’t be able to miss it. As always, if you have any questions, please do not hesitate to call or stop in my office. Let’s make it a great year! 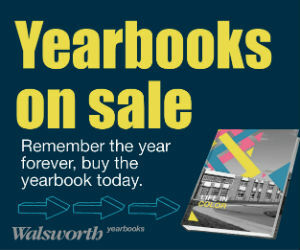 Click the image below to purchase yearbooks!